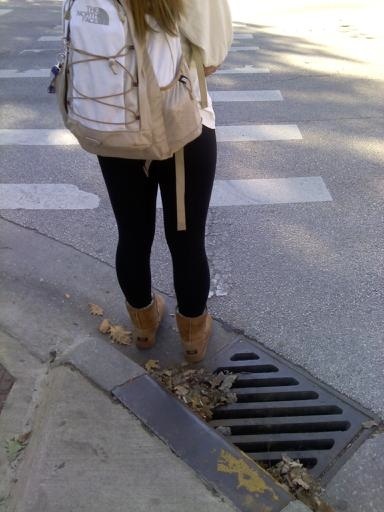 The UGGS + nopants + north face trifecta strikes for the first time on campus this fall, caught walking back to bromley from the quad by Alyssa. Gotta love all that camel-colored apparel. Also, very important news! This month, the first UIUCNoPants sister site has launched!! Check out VT NoPants for the latest pantsless-on-campus documentation of Virginia Tech! UIUCNoPants is honored that other schools are jumping on board against nopants at their own schools. It is both refreshing and frightening to see nopants photos on unfamiliar-looking sidewalks. thanks so much for the link and for the support through the setup process! Who was creeping on me?! who wouldn’t creep on you, lind? Did the site get taken down?